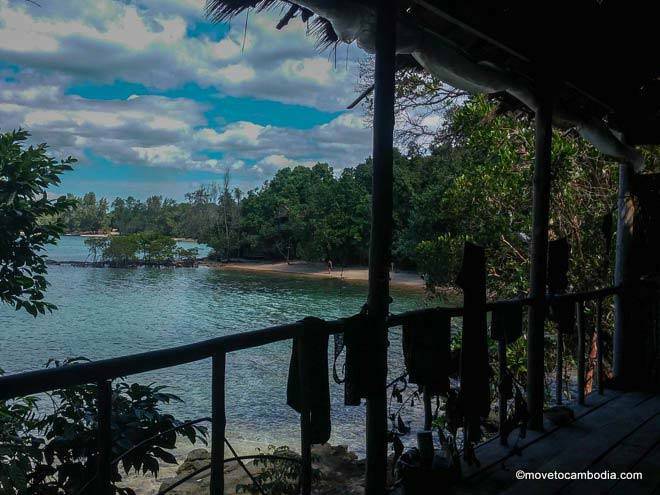 Koh Ta Kiev’s first resort remains its most iconic. Picture-perfect treehouses, a funky bar and two restaurants serving great food and delicious cocktails, secluded beaches, gorgeous island views— Ten103 Treehouse Bay offers explorers from all walks of life a real-life paradise. 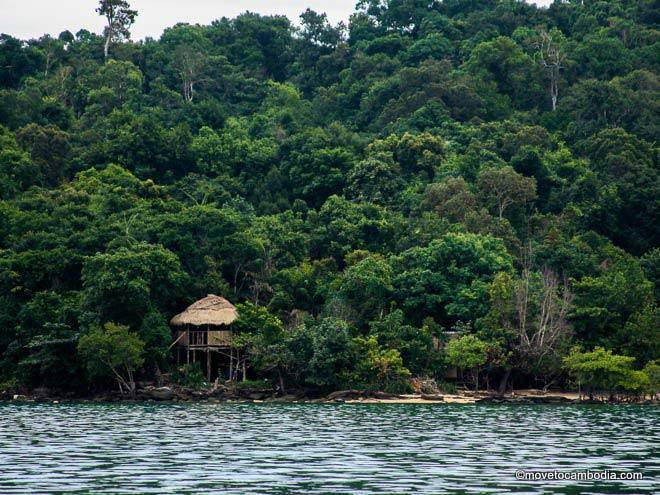 Koh Ta Kiev’s Ten103 Treehouse Bay is the OG on the island. Located at the southernmost point of Long Beach, Ten103 is known for its friendly staff and attention to detail. From the artwork to the pirate flags, from the swings dotted around the sandy beaches to the tasty food and drink, everything is designed to complement the resort’s beautiful setting. 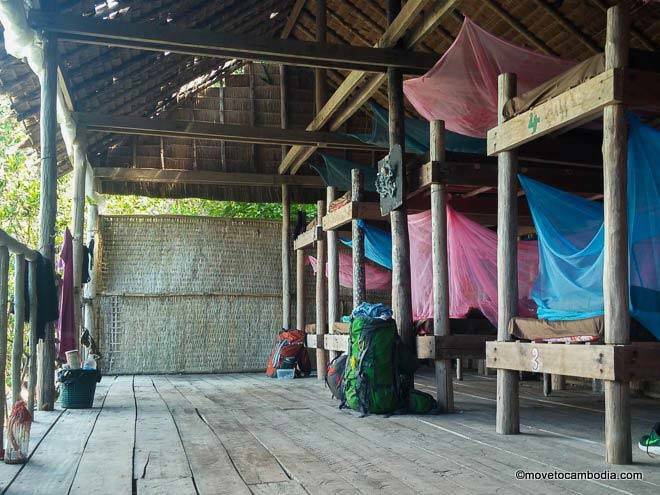 Ten103 has recently expanded and now offers an even wider array of accommodation, in treehouses, bungalows, tents and dorms, plus two restaurants serving a variety of Cambodian and Western dishes. 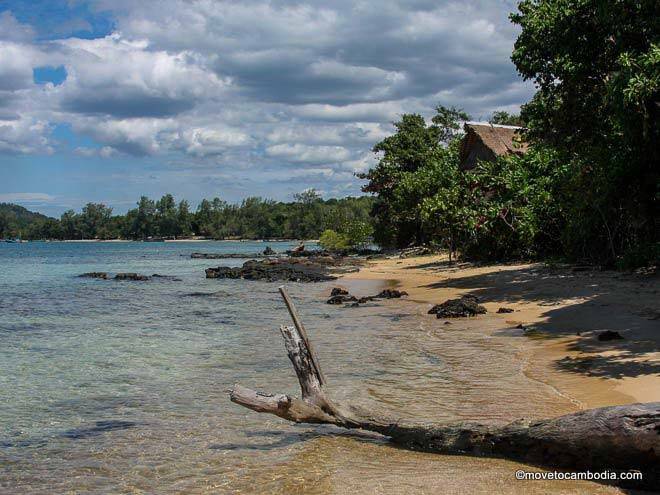 Ten103 is ideally situated with several sandy coves and secluded bays. A private beach is ideal for lazing in the sun with a good book, and there are plenty of great titles available in the resort’s book exchange. When relaxation palls, ask to borrow a frisbee, or rent a snorkel and mask and marvel at the nearby reefs, or explore Ten103’s mangroves, volcanic rock formations, rocky cliffs, and lush jungle. A shortcut leads to Plankton Beach, or head out on the Chinese Road. Just before sunset every day, Ten103 runs its own boat trips out to Elephant Rock for cliff-jumping, cheap beers, and sunset views. Sign up at the bar in the morning or ask when you arrive in on the boat. The view from the Ten103 dorm. Feeling sociable? Ten103’s bar is pretty lively morning, mid-day, and night, with live music and events throughout the week, including a trivia night, open mic performances, fire shows, karaoke, and even a movie night every now and again. The resort also offers weekly specials on food and cocktails. The original Ten103 restaurant features homemade breads, tapas plates, and a variety of Western and Khmer dishes, including a delicious all-day breakfast. Non-carnivores can head to the resort’s second restaurant, Plai, the island’s first entirely vegan/vegetarian eatery. There’s even a sandwich bar where you can pick your favorite fillings for a delicious picnic lunch. Dishes range from $3 to $8 and the kitchen is open from 7:30 a.m. to 9 p.m., while the bar stays open late into the evening. Ten103’s wide range of accommodation caters to couples, families, and solo travelers alike. Ocean-front dorm beds, hammocks, bungalows, treehouses, and family rooms are available all year around. Their famed treehouses come in a variety of different comfort levels and are very reasonably priced, although they are a little rustic. All but one have shared bathrooms, and there are bucket showers located in the bar. All the treehouses were hand-built from repurposed wood from the jungle and so each has its own unique character. They all have wonderful sea views, and some come with their own little stretch of beach, while others have private balconies and hammocks. A separate structure, the Drunken Pencil, has three self-contained units in a secluded area, perfect for families and groups of friends. Upstairs are one double bed and three singles, and the downstairs is split into two separate double rooms. The Pencil has its own bathroom and there is power while the generator is on. The interior of the Ten103 dorms. Seeking paradise on a budget? Consider one of the ten comfortable beds in the open-fronted sea-view dorm, or string up a bed in the resort’s dedicated hammocking spots, whose thatched roofs provide protection from the elements. An even more inexpensive option is to pitch your own hammock or tent for a nominal fee. To get over to Ten103, take the boat that leaves from SeaGarden every morning at 11 a.m. Alternatively, you can board one of the tour boats that come to the island and walk down from Long Beach. But in that case be sure to book online or telephone ahead to let the Ten103 crew know that you are not coming on their boat so they don’t give away your spot at the resort! The resort can get very busy, so it’s wise to call ahead or book online to reserve your favorite bungalow or treehouse. In addition, sometimes Ten103 offers pick-ups from Banana Beach on Otres 2 or Monkey Maya in Ream, so it’s always worth giving them a call. The regular boat costs $13 return and takes just over an hour, so bring water and wear sunscreen. In the rainy season the sea often gets too rough for the longtail boats, so they normally run from Ream instead, but transport from Otres will still be provided. Sometimes, when the weather is particularly bad, you may have to walk through the jungle to the fishing village in order to get on the boat there. If that’s a possibility, we advise you to pack light, just in case. 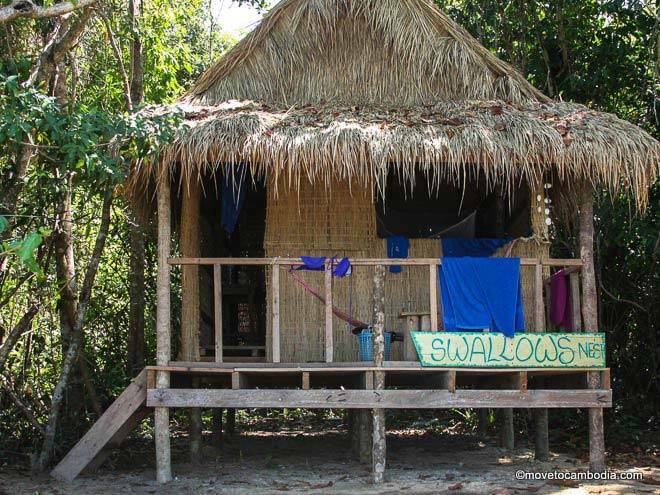 Make a booking at Ten103 Treehouse Bay now, or look for other accommodation on Koh Ta Kiev.